John Mayer used a 1950s Fender Tweed Twin on stage alongside his usual set -up. Alongside the 60s, 70s and Re-Iusse Twins, he uses a 50s Twin too. "In addition, Grohl -- who played all the guitar parts on Nothing Left -- abandoned ..... Amps: Vox AC30, Mesa/Boogie Maverick and Heartbreaker, Fender Twin." At the back of his rack we spotted a 50s Tweed Twin which he uses sometimes. Besides the 60s and late 70s Twins, Josh used a 50s Backup Twin on Stadium Arcadium. "Congratulations to Bob for picking up Joe Satriani's '59 Fender Twin amp and thanks to Joe for coming down to tell the stories and history of such an iconic piece! Shop Joe's pre-owned gear now http://bit.ly/2vwB3Tt". "...and I was probably using an old Fender Twin from the ’50s." "With my amp set up, the Rickenbacker's just perfect as it goes through a Fender 50s twin..."
A late 1950s Fender Twin Amplifier with tweed covering, metal plate with Fender Twin-Amp, brown speaker cloth, two 12-inch speakers, control panel with four inputs, three switches and six rotary controls. This was Robbie’s main amp with The Band. You can see it on stage in The Last Waltz. "The Music Man is run through a rental Fender Twin." A pair of old '50s Tweed Twins appear in the beginning of this video. On Eric Clapton's 'One More Car, One More Rider' World Tour, Andy Fairweather used this amp on stage. Carlos Santana used a 1950s Fender Twin on occasion. While in the studio for Eric Claptons "Session For Robert J", Doyle Bramhall II used a 1950s Fender Twin. "Back in the 70s I used a Strat with a Fender Twin..."
"Phil Palmer uses the EC Strat with Lace pups too.... and he uses a 50s Fender twin amp, and assume he uses a preset for leads..."
A Fender Twin can be seen at 32:14 of this "Rig Rundown" with *Premier Guitar*. Keith also has a second Twin that's a 1960. According to this Music Radar [article](http://www.musicradar.com/us/news/guitars/rory-gallaghers-gear-the-key-guitars-amps-and-effects-546815/13), "With the addition of Lou Martin on keyboards to Rory’s band in 1973, the guitarist looked for an amp that would work better within the group’s fuller sound and began to favour Fender combos, such as this Fender Twin, which became a studio favourite. The amp has a very early serial number (0070), so Rory was cautious about taking it on the road." It also mentions that this amp was used on the albums Tattoo and Blueprint. In this Instagram photo taken by Philip Sayce you can spot a vintage, 1950s Fender Twin amp. 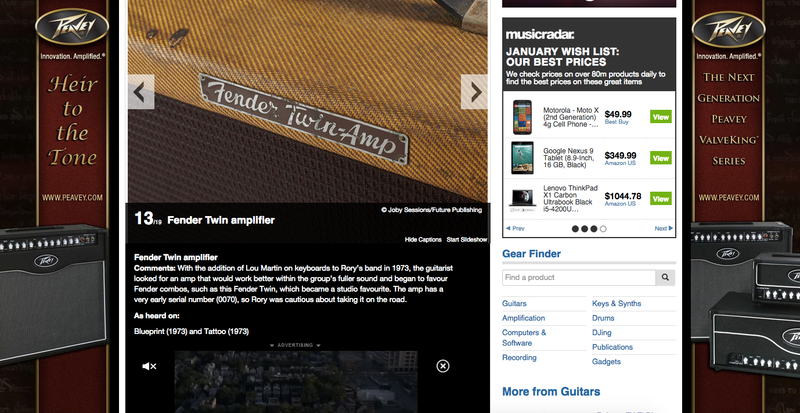 According to Premier Guitar, Steen uses the 1950s Fender Twin, which was previously owned by Eric Clapton. In the background you can see Kristian's Fender Twin amp. "Back at the studio at my house, doing the more shoegazey kind of music, I was using a Fender Twin…"
No reviews or videos yet for 1950s Fender Twin. With an Equipboard account you can rate this item, add it to your collection, submit a review to discuss what you like and dislike about it, and associate 1950s Fender Twin to artists that use it. Create an account!